There’s a moment of genius near the end of Lucy Kirkwood’s new play Chimerica that manages that all-too-rare feat of managing to unearth something genuinely new out of the familiar, challenging the way we hold viewpoints and the assumptions that come with them. It is a startling realisation, excellently executed and one which allows for an interesting reinterpretation of what has gone before. Kirkwood’s subject is the fast-changing and complex relationship between China and the USA and sprawls ambitiously over 24 years and multiple storylines to create an unwieldy epic, co-produced with Headlong, that just might be one of the most interesting and exciting pieces of new writing in London. 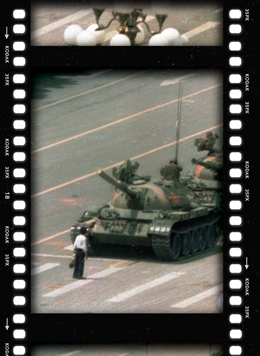 At the heart of the story is Joe Schofield, a photojournalist responsible for one of the iconic images of the twentieth century in capturing the moment a protestor stood in front of a tank in Tiananmen Square, who gets the sniff of a new story when he finds out the man might be living in America. As he pursues this new lead through the nooks and crannies of Chinatown to glittering political fundraisers, his singlemindedness threatens his relationships with the friends and lovers around him, but also with his key Chinese friend and contact for whom the price to pay is significantly higher. 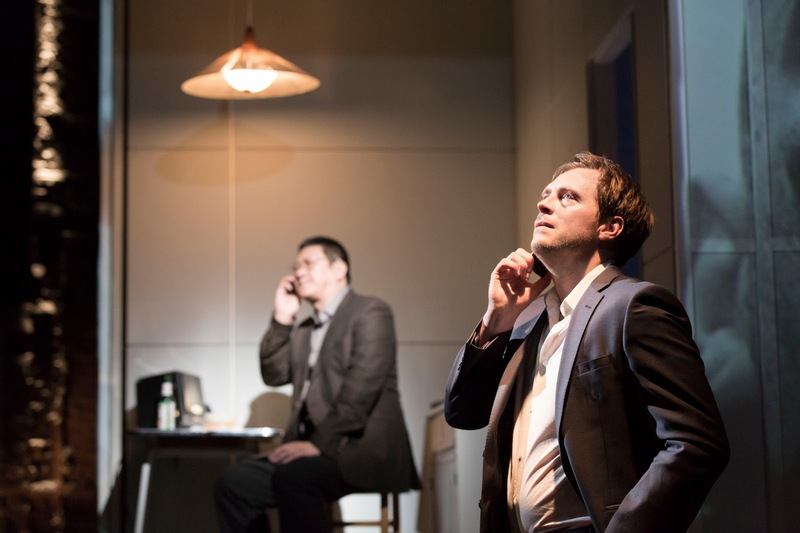 Given the running time and the number of scene changes, Lyndsey Turner’s direction is remarkably nifty, aided by one of the set designs of the year in Es Devlin’s revolving, gauze-covered box which is augmented by Finn Ross’ intriguing projections. And with a cast full of excellent performances, there’s excellent work from all concerned, whether Claudie Blakley’s fascinatingly brittle market researcher who is exploring how best to crack open the Chinese market, Sean Gilder’s grizzled reporter or the multi-character work from the likes of Elizabeth Chan, Vera Chok, Trevor Cooper and Nancy Crane. Chimerica belongs to its two central performances though. Stephen Campbell Moore hasn’t been better than as the headstrong Joe, plunging recklessly into the pursuit of ‘Tank Man’, never stopping to see how the repercussions of his actions are playing out, either for himself or for others, until it’s too late. And in what is proving to be remarkable year for Benedict Wong after headlining #aiww, he is just outstanding as Zhang Lin, Joe’s quietly dissident friend who has his own stories to tell about Tiananmen Square and the air pollution in Beijing and not even the tightening grip of the authoritarian fist can prevent him from telling it, Wong particularly excelling with an almost martyr-like grace. And it is he who offers the subtle shift in perspective, the change in focus that suddenly reminds us that no matter how neutral an observer we might consider ourselves, we’re as subject to manipulation as any citizen living under a repressive regime, propaganda persists no matter where we are. With that in mind, I would have liked to have heard more voices from contemporary China in the play, but with an already cluttered character list, I can see why there weren’t. It is hard to shake the feeling that Kirkwood could have trimmed down her writing to a more bum-friendly length but the cumulative effect of this dizzying mosaic of past and present, East and West is one which is thrilling indeed.